42 Restyling & tRuck AccessoRies | May 2015 restylingmag.com holds true. In fact, if a problem or sensitive issue occurs and you handle it the right way, it can gain a customer's confidence and put you in a better position to obtain a referral. Perhaps a vehicle wrap didn't line up as it should. There are a variety of reasons this may have happened. It could be due to a poor design, a bad print job or a mistake by the installer. Perhaps a defroster was broken during a window tint. When these types of problems occur that shouldn't have happened, you will have to bite the bullet and fix these problems for free. Humility Often undervalued, humility is a highly admirable trait. One way to demonstrate humility is to give credit to your team when they do a great job. Another way to demonstrate it is to be humble enough to obtain insight and advice from business and restyling experts at educational ses- sions and even other restylers you might meet at a trade show. The moment you think you know it all, a lack of humility can lead to your downfall. EmpatHy Being empathetic with customers is impor- tant. Often, people confuse empathy with compassion. Here's the difference: compas- sion is the ability to feel the way others feel; empathy is having the ability to put yourself in another person's situation, experience their feelings and emotions, and communicate these accordingly. For example, "Price is a concern for everyone, including me. And everything seems to cost more these days. Mr. Jones, we have been in business for more than 20 years. We would not overcharge you for the sunroof and interior overhaul. Let me go through all the charges and break them down for you." intEgrity Without integrity, you will never convince anyone that you are going to do what you say you are going to do. The old adages walking the talk, practice what you preach, doing unto others… all play a strong part in projecting integrity. Also, refrain from badmouthing your competition. If a cus- tomer states, "I'm talking to XYZ Restyler too," just say, "I know them. They do a good job. Should you make the decision to restyle your truck with us, we will do the best job anyone could ever do for you." profEssionalism How you or anyone at your place of busi- ness answers the phone reflects your level of professionalism. "Good Morning, this is John's Restyling, John speaking. How may I help you today?" This, along with the appearance of your shop, makes an immediate impact on how a customer will judge the level of professionalism of your business. Whether at your shop, or an after- hours social function, or on a business trip, behaving in a professional manner is important. That doesn't mean you can't laugh and have fun when appropriate, but remember that in business, people are watching your behavior constantly. Don't let your guard down in the professionalism department or you might be shooting yourself in the foot when you don't realize you're doing it. rEspEct Demonstrate respect for others. 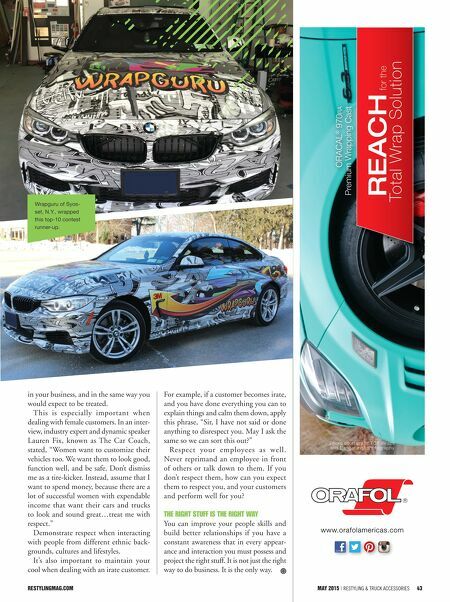 Treat every customer like the most important person your VEHiclE & yoursElf Wrap 42 Restyling & tRuck AccessoRies | May 2015 PDX Wraps of Sher- wood, Ore., wrapped this top-five runner-up in 3M's Wrap to Win contest. This wrap, by 51 Wraps in Tulsa, Olka., was the second place finisher in the 3M Wrap to Win contest.